The original failed attempt came after a series of random tweets last September when President Trump announced he was instituting the ban for “cost reasons” despite evidence to the contrary. The military currently spends $84 million annually on erectile dysfunction medication, according to an analysis conducted by the Military Times. To be clear that’s 10 times the cost of what the military could be spending on gender and hormone therapy related medical care for transgender troops. In October, a Federal judge blocked the ban calling it “unconstitutional,” a decision which continues to remain in effect despite the administrations recent attempts at blocking members for a second time. These constant attempts follow other decisions made by this administration. Let me remind you when they tried to remove seven words from CDC funding, including the words “diversity” and “transgender,” which doesn’t help in humanizing this part of our population. I recently spoke with two service members, one active and one a vet, both transgender. I wanted to get a full understanding of the real danger this challenge poses for one of the most marginalized and vulnerable communities in our country. A year later, Trumps tweets about reinstating the ban left Taryn, the military’s transgender community and the military in general feeling blindsided. “It was a very clear indication that our presence wasn’t wanted only a year after finally being able to openly be ourselves. For many, it was also a chance to finally begin their transition because we had felt comfortable enough to do so,” said Taryn. Despite Taryn’s many years of service to this country, this ban puts his entire livelihood at stake. Living his life and loving his job, Taryn bought his first home over a year ago, finished a degree and has started working on another and is considering his choices for family planning. If he’s no longer allowed to proudly serve his country because he’s trans, where does that leave his future? I also spoke Bryce Celotto, a transgender vet who was initially quite upset by the ban, but not at all surprised by it. After all, the LGBTQ+ community (particularly transgender people) has witnessed a long-standing pattern of attacks from the current presidential administration. Veteran Bryce Celotto pre and post transition. Bryce’s military career was however cut short when he was forced out due to his gender identity and the transition from female to male. Although initially devastated, he was able to pick up the pieces and make an amazing transition into civilian life. READ MORE: So where can we get all the new Black Panther toys? Since that time, Bryce has earned three degrees – including a Master’s Degree from Brown University – and is now a public-school teacher. Transgender people are often targets of hate crimes, and attacks from legislation continue to endorse the violence many of them face in society. Taryn and Bryce have honorably served this country, only to watch it turn its back on them when the thing they needed most was support. Transgender people are people—plain and simple. Taryn and Bryce are just two examples of hundreds of thousands of individuals who put country, justice, and sacrifice above all. Why should gender identity get in the way of their patriotic beliefs? Taryn, who currently serves, takes it back to the fundamentals. “There are many things that the military has covered for some time and providing treatment to the trans military community is no different from say breast augmentation, Lasik eye surgery or a prescription for Viagra or Xanax,” said Taryn. It’s important to remember that if we are not changing, then we are standing still. Hopefully, the ban will be blocked permanently, and America will get onto the right side of history. 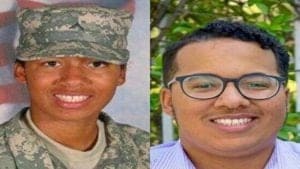 The post Black, trans, and banned from the military: Two soldiers tell their stories appeared first on theGrio.